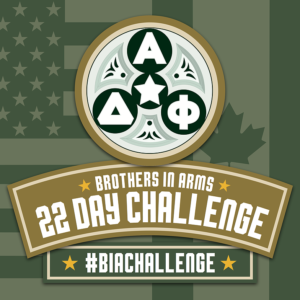 The Brothers In Arms Challenge was developed in an effort to establish a fraternity wide philanthropic campaign devoted to tackling the issue of active duty soldiers and military veterans taking their own lives. The Brothers in Arms Challenge is a call to action for all Alpha Delta Phi chapters to get out in their communities and make an impact. Over the course of twenty-two days, chapters are encouraged to raise awareness on their campus, volunteer in their communities, and raise money for Stop Soldier Suicide and Veterans Transition Network. The reason behind the twenty-two day length is due to the fact that everyday, 22 veterans and 1 active duty soldier commit suicide. The chapter who raises the most money (and records it online) will receive a custom made crystal monument award to display in their chapter house with pride. The award will be presented by representatives from both charities at the annual convention. 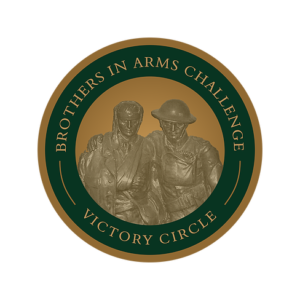 The Top 5 fundraising brothers (who record it online) will receive a custom “challenge coin” and be included in the “Victory Circle”. The top raiser will receive a small crystal monument to commemorate his achievement. Our very own brother, Jonathan “JP” Wong (CONN, ’18), was awarded a “challenge coin” at this past convention, as he was in the top 5 for all brothers nationally for his fundraising efforts.